The main function of this app is to let you capture the events and experiences of your life, record unique thoughts and ideas, set goals for the future and solve difficult problems that you face. This journal is all about simplicity. It has no bells and whistles in it, only the necessary functionality. It has two main parts to it. One is the ‘Stream’ of your entries. Another is the ‘Filter’. On an iPad you can see both of them at the same time, on an iPhone you switch between them. Click on the image to enlarge it. The entries in the ‘Stream’ are presented in chronological order with the newer entries being on top. Every entry belongs to a group of entries. Examples of groups are: ‘thoughts’, ‘quotes’, ‘my plans’, etc. In the ‘Filter’ you choose which groups of entries should be shown in the ‘Stream’. You can choose to show one group, several groups or all groups. The groups are editable. I was inspired to create this app by Jim Rohn’s audiobook on keeping a journal. You can listen to it here. For many years I’ve been trying to keep a journal of some sort or another. I believe that keeping a journal can make a huge impact on one’s life. From my experience with journals I can tell you this. Having a journal is better than not having one, but my journals have always been chaotic and messy. I’ve never had a good system to keeping them. Jim Rohn in his audiobook gave me the system I needed. But it was still not good enough for me.I find that having several sections in a journal is somewhat troublesome. I tried this approach but it turned out that I tend to read some of the sections and neglect the others. And if I use up all the space allocated for one section, I would continue writing entries of that section in the wrong sections. It may be that these troubles were caused not by the system itself but by my lack of discipline. Anyway, recently I started to think, maybe it’s time for me to stop using paper journals altogether and switch to some journaling app. I found some apps in the AppStore but they were not exactly what I wanted. Too many bells and whistles. I wanted an app that would be as simple as a paper journal. Finally I came up with this idea of having just a stream of entries which you can filter. Of course, you can use the journal however you wish, but here are my suggestions. Who knows, they might help. Let me just propose some groups that you can use in the journal. Ideas (or thoughts). This is easy. Just record ideas that you come across during a day. Quotes. Record quotes. Preferably with a name of the author. Now, quotes are thoughts also. 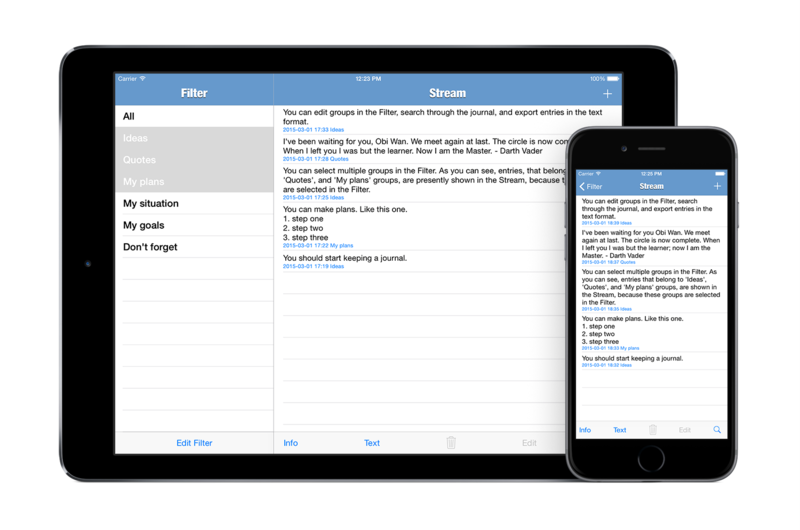 So, when you read your journal you can select ‘ideas/thoughts’ and ‘quotes’ groups simultaneously. My location. Every thought has time and location. The journal remembers the time of creation of each entry automatically, but it would also be useful to write down where you are at the time you get a good idea. You can do it right inside the entry where you store the idea itself, but I think it may be good to have a separate group for your locations. Whenever your location changes (like when you move to other city or maybe even when you get to your workplace or back home from work) you just make an entry in your ‘My location’ group. Now if you select ‘ideas’ and ‘My location’ groups at the same time, the entries from these two groups will be shown together and ordered chronologically so that you’ll be able to figure out where you were when this or that idea came to your head. My situation. In this group I suggest you write down your current situation in life. What problems you have. What bothers you. They say, if you write your problem down, it is half-solved already. And it’s going to be fun to read these entries later, when the problems in your journal no longer bother you in real life. My plans. Just write down steps you need to take to solve your problems. Now, again, it may be useful to read two groups at the same time: ‘My situation’ and ‘My plans’. So you can see your problems and solutions to them at the same time. Other groups might be Goals, Events, etc. I even have a Humour group which I use for writing down some jokes and other funny stuff. Again, I highly recommend you spend an hour and listen to Jim Rohn’s audiobook. If you are serious about improving your life by keeping a journal, you definitely should do it. Think of this one hour as an investment in your better future. If I were you I would even take some notes while listening to this audiobook. As of today (March 2015) I’m only starting to really use my app. So, my suggestions are not based on my experience. Maybe later I will change them. What’s more interesting is that after you use the app for some time, you may come up with your own way of using it. When that happens, I would like to hear from you. Just give your suggestions in the comments below. Tell me what groups you have and how you use them. Your experience may be beneficial for many people. They say, you should give your best work away for free, so that’s what I’m doing with this app. I want more people to know about me and my blog, that’s why I’m giving my best app away for free. I have paid apps too, and, hopefully some of the users of Stream Journal will buy some of them (for example check out my paid app Simple Q&A Diary), but the Stream Journal will always remain free with no ads and in-app purchases. Moreover I intend to constantly improve it. I plan to redesign the app soon. And in the subsequent release I will add import/export/backup/restore capability. If you have any suggestions on how I might improve the app, please, leave your comments below or contact me via social networks. 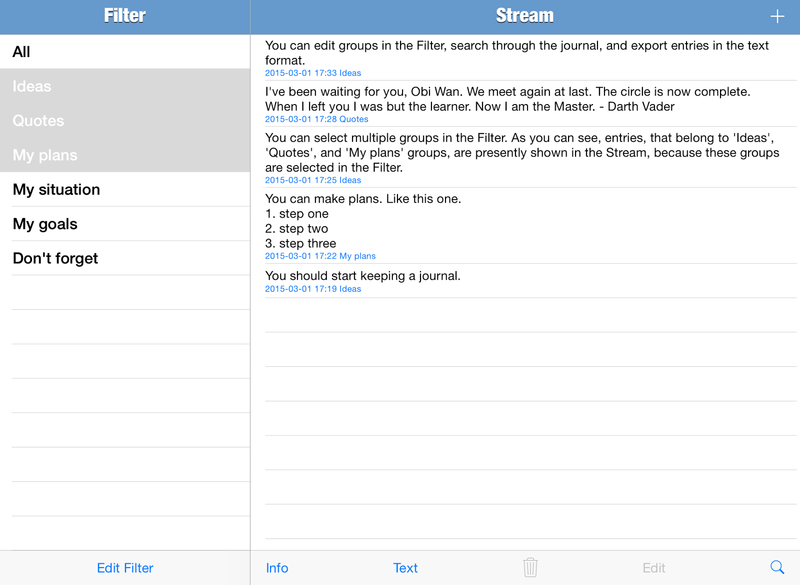 I hope you find Stream Journal useful. If so, I would really appreciate it if you rate it on App Store. If you have suggestions on how to make the app better, please, leave them in the comments section below.